The kidneys are a pair of organs on either side of the spine in the lower abdomen. Each kidney is about the size of a fist. Attached to the top of each kidney is an adrenal gland. 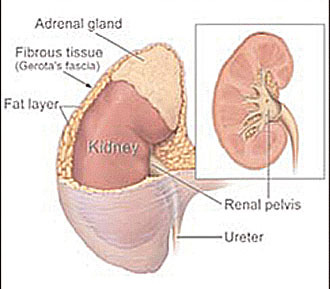 A mass of fatty tissue and an outer layer of fibrous tissue (Gerota's fascia) enclose the kidneys and adrenal glands. The kidneys are part of the urinary system. They make urine by removing wastes and extra water from the blood. Urine collects in a hollow space (renal pelvis) in the middle of each kidney. It passes from the renal pelvis into the bladder through a tube called a ureter. Urine leaves the body through another tube (the urethra). The kidneys also make substances that help control blood pressure and the production of red blood cells. Kidney cancer is any of several types of cancer can start in the kidney. The most common type of kidney cancer in adults is renal cell cancer, which is also called renal adenocarcinoma or hypernephroma. Another type of cancer, transitional cell carcinoma, affects the renal pelvis. It is similar to bladder cancer and is often treated like bladder cancer. Wilms' tumor is the most common type of childhood kidney cancer. It is different from adult kidney cancer and requires different treatment. What follows applies specifically to renal cell cancer. Long-term dialysis: Renal dialysis is a treatment for people whose kidneys do not work well. It removes wastes from the blood. Being on dialysis for many years is a risk factor for kidney cancer. Most people who have these risk factors do not get kidney cancer. On the other hand, most people who do get the disease have no known risk factors. Intravenous pyelogram (IVP): The doctor injects dye into a vein in the arm. The dye travels through the body and collects in the kidneys. The dye makes them show up on X-rays. A series of X-rays then tracks the dye as it moves through the kidneys to the ureters and bladder. The X-rays can show a kidney tumor or other problems. CT scan (CAT scan): An X-ray machine linked to a computer takes a series of detailed pictures of the kidneys. The patient may receive an injection of dye so the kidneys show up clearly in the pictures. A CT scan can show a kidney tumor. Biopsy: In some cases, the doctor may do a biopsy. A biopsy is the removal of tissue to look for cancer cells. The doctor inserts a thin needle through the skin into the kidney to remove a small amount of tissue. The doctor may use ultrasound or X-rays to guide the needle. A pathologist uses a microscope to look for cancer cells in the tissue. Surgery: In most cases, based on the results of the CT scan, ultrasound, and X-rays, the doctor has enough information to recommend surgery to remove part or all of the kidney. A pathologist makes the final diagnosis by examining the tissue under a microscope. To plan the best treatment, the doctor needs to know the stage (extent) of the disease. The stage is based on the size of the tumor, whether the cancer has spread and, if so, to what parts of the body (see illustration above). Staging may involve imaging tests such as an ultrasound or a CT scan. The doctor also may use an MRI. For this test, a powerful magnet linked to a computer makes detailed pictures of organs and blood vessels. Stage I is an early stage of kidney cancer. The tumor measures up to 2¾ inches (7 cm). It is no bigger than a tennis ball. The cancer cells are found only in the kidney. 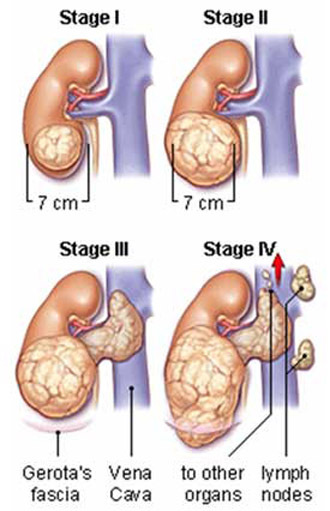 Stage II is also an early stage of kidney cancer, but the tumor measures more than 2¾ inches. The cancer cells are found only in the kidney. - The cancer cells have spread from the kidney to a nearby large blood vessel. Cancer cells may be found in one nearby lymph node. - The cancer has spread to other places in the body such as the lungs. Recurrent cancer is cancer that has come back (recurred) after treatment. It may come back in the kidney or in another part of the body. Treatment depends mainly on the stage of disease and the patient's general health and age. People with kidney cancer may have surgery, arterial embolization, radiation therapy, biological therapy, or chemotherapy. Some may have a combination of treatments. At any stage of disease, people with kidney cancer may have treatment to control pain and other symptoms, to relieve the side effects of therapy, and to ease emotional and practical problems. This kind of treatment is called supportive care, symptom management, or palliative care. Because treatment may damage healthy cells and tissues, unwanted side effects are common. These side effects depend mainly on the type and extent of the treatment. Side effects may not be the same for each person, and they may change from one treatment session to the next. Before treatment starts, the health care team will explain possible side effects and suggest ways to help the patient manage them. Surgery is the most common treatment for kidney cancer. It is a type of local therapy. It treats cancer in the kidney and the area close to the tumor. Radical nephrectomy: Kidney cancer is usually treated with radical nephrectomy. The surgeon removes the entire kidney along with the adrenal gland and some tissue around the kidney. Some lymph nodes in the area also may be removed. Simple nephrectomy: The surgeon removes only the kidney. Some people with Stage I kidney cancer may have a simple nephrectomy. Partial nephrectomy: The surgeon removes only the part of the kidney that contains the tumor. This type of surgery may be used when the person has only one kidney, or when the cancer affects both kidneys. Also, a person with a small kidney tumor (less than 4 centimeters) may have this type of surgery. It takes time to heal after surgery, and the time needed to recover is different for each person. Patients are often uncomfortable during the first few days. However, medicine can usually control their pain. Before surgery, patients should discuss the plan for pain relief with the doctor or nurse. After surgery, the doctor can adjust the plan if more pain relief is needed. It is common to feel tired or weak for a while. The health care team watches the patient for signs of kidney problems by monitoring the amount of fluid the patient takes in and the amount of urine produced. They also watch for signs of bleeding, infection, or other problems requiring immediate treatment. Lab tests help the health care team monitor for signs of problems. If one kidney is removed, the remaining kidney generally is able to perform the work of both kidneys. However, if the remaining kidney is not working well or if both kidneys are removed, dialysis is needed to clean the blood. For a few patients, kidney transplantation may be an option. For this procedure, the transplant surgeon replaces the patient's kidney with a healthy kidney from a donor. Arterial embolization is a type of local therapy that shrinks the tumor. Sometimes it is done before an operation to make surgery easier. When surgery is not possible, embolization may be used to help relieve the symptoms of kidney cancer. The doctor inserts a narrow tube (catheter) into a blood vessel in the leg. The tube is passed up to the main blood vessel (renal artery) that supplies blood to the kidney. The doctor injects a substance into the blood vessel to block the flow of blood into the kidney. The blockage prevents the tumor from getting oxygen and other substances it needs to grow. After arterial embolization, some patients have back pain or develop a fever. Other side effects are nausea and vomiting. These problems soon go away. Radiation therapy (also called radiotherapy) is another type of local therapy. It uses high-energy rays to kill cancer cells. It affects cancer cells only in the treated area. A large machine directs radiation at the body. The patient has treatment at the hospital or clinic, 5 days a week for several weeks. A small number of patients have radiation therapy before surgery to shrink the tumor. Some have it after surgery to kill cancer cells that may remain in the area. People who cannot have surgery may have radiation therapy to relieve pain and other problems caused by the cancer. The side effects of radiation therapy depend mainly on the amount of radiation given and the part of the body that is treated. Patients are likely to become very tired during radiation therapy, especially in the later weeks of treatment. Resting is important, but doctors usually advise patients to try to stay as active as they can. Radiation therapy to the kidney and nearby areas may cause nausea, vomiting, diarrhea, or urinary discomfort. Radiation therapy also may cause a decrease in the number of healthy white blood cells, which help protect the body against infection. In addition, the skin in the treated area may sometimes become red, dry, and tender. Although the side effects of radiation therapy can be distressing, the doctor can usually treat or control them. Biological therapy is a type of systemic therapy. It uses substances that travel through the bloodstream, reaching and affecting cells all over the body. Biological therapy uses the body's natural ability (immune system) to fight cancer. For patients with metastatic kidney cancer, the doctor may suggest interferon alpha or interleukin-2 (also called IL-2 or aldesleukin). The body normally produces these substances in small amounts in response to infections and other diseases. For cancer treatment, they are made in the laboratory in large amounts. Biological therapy may cause flu-like symptoms, such as chills, fever, muscle aches, weakness, loss of appetite, nausea, vomiting, and diarrhea. Patients also may get a skin rash. These problems can be severe, but they go away after treatment stops. Chemotherapy is also a type of systemic therapy. Anticancer drugs enter the bloodstream and travel throughout the body. Although useful for many other cancers, anticancer drugs have shown limited use against kidney cancer. However, many doctors are studying new drugs and new combinations that may prove more helpful. Blood cells: These cells fight infection, help the blood to clot, and carry oxygen to all parts of the body. When drugs affect blood cells, patients are more likely to get infections, may bruise or bleed easily, and may feel very weak and tired. Follow-up care after treatment for kidney cancer is important. Even when the cancer seems to have been completely removed or destroyed, the disease sometimes returns because cancer cells can remain in the body after treatment. The doctor monitors the recovery of the person treated for kidney cancer and checks for recurrence of cancer. Checkups help ensure that any changes in health are noted. The patient may have lab tests, chest X-rays, CT scans, or other tests.